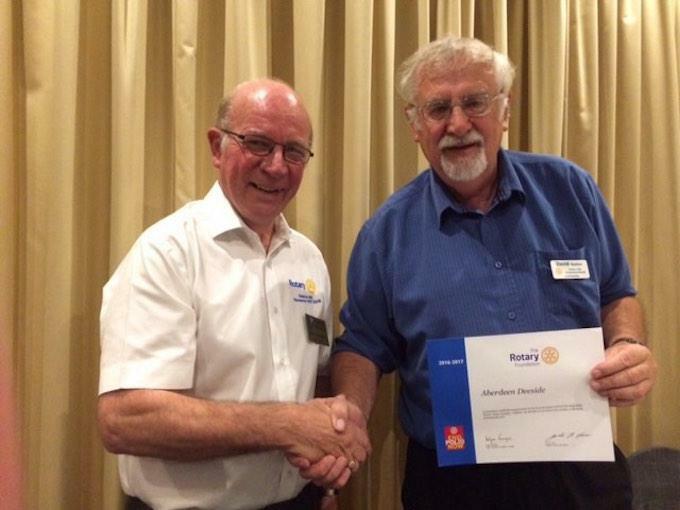 District Gonvenor Graeme Archibald presented the Club with a 'Certificate of Merit' in recognition of Rotary Club of Aberdeen Deeside’s contribution to ‘End Polio’. District 1010 Governor - Graeme Archibald, visit to RCAD 22 Nov 17. District Governor Graeme Archibald began by bringing greetings from his own club of Elgin. He then spent some time commending Aberdeen Deeside for its enthusiasm and innovation and mentioned many of the activities the club has been involved in. He then turned to some of the challenges that Rotary as a whole faces. Membership is one of the biggest of these. Aberdeen Deeside does comparatively well in this area, but the same is not true for the organisation as a whole in the UK which now has less than half the members it had 5 years ago. He indicated his belief that it was necessary to use PR to get across the message of what Rotary does. One way to do this is to count up the number of hours spent and reckon up the value in kind. Clubs could count the number of hours members spent on activities and using £1 per hour put a monetary value on their activities. Rotary Central provides advice on this. Clubs should use social media, statistics and be open to changed ways of doing things. District is there to support clubs and it is hoped clubs will work together in clusters to complete projects, raise money and publicise the organisation. His theme for the year is “Working Together’ and he saw Rotary Foundation as a key means of achieving this. Support for Foundation helped clubs to then apply and receive funding back. In District 1010 £32k was received this year for 9 international and 4 District projects. This amounted to 2/3 of the cost. He also stressed the need to continue supporting ‘End Polio’. Earlier this year the world had four months in which no new cases of polio were reported. 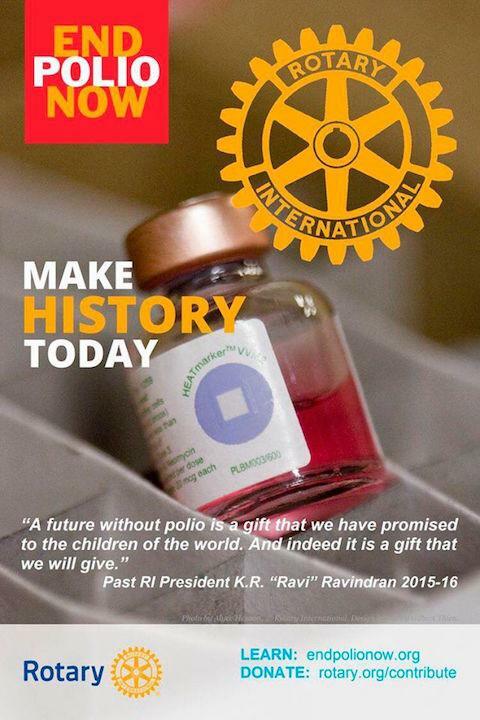 A polio free world is very near reality but without sustained action will not happen. Bill Gates has promised 300 million dollars in the next 3 years and has challenged Rotary to raise $50M in each of these years. This was easily possible if we all worked together. DG Graeme ended by wishing the Club a successful year and presented President Dave Gordon with a Certificate of Merit in recognition of Aberdeen Deeside’s contribution to ‘End Polio’ last year. President Dave thanked DG Graeme for visiting the Club and giving us an insight into his hopes for Rotary.